Find Me on "The Wall"
The team at Footnote.com have been working on a very special project for the past few months. 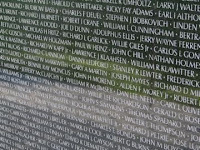 They've captured images of the Vietnam Wall in Washington D.C. and have added a tremendous amount of information to the names of every person listed on it. The entire wall has been masterfully photographed and is searchable by name. Who is represented by all of these names? They are the fallen heros of the Vietnam war. The statistics listed are astounding. 58,322 names, 2,056 bodies not recovered and an average age of 22.8 years. When you find your family member, friend or other name, click on their name and you are presented with their information, such as date of birth, date of death, branch of the service and other significant information. Now that this page exists, you can add photos, written remembrances, histories and other details about them so today's and tomorrow's generations will not forget them, their bravery and their service to the nation. Click here to watch the comments by one Vietnam Veteran about finding the name of his friend on the wall. You too will begin to feel the "infection" that seeing these names evokes in your heart. Watching the short video is time well spent. The names represent real people, each with a unique story who died in service to their country. Not only is the physical site of the wall sacred ground, but now its specific digital location becomes sacred ground. There is no cost to view the wall or to add comments. Sit down and take a tour of the wall today. Is it a historical presentation? Yes. A family history presentation? YES! All of us hope that someone remembers us after we too have passed on. Now, you can remember your fallen family and friends by using "The Wall" and adding remembrances and photos of them. I am researching the Bennetts and I have a great deal of information to add to your list . the Glenn and Grace Bennett family and to the present plus more about Asa and his wife.